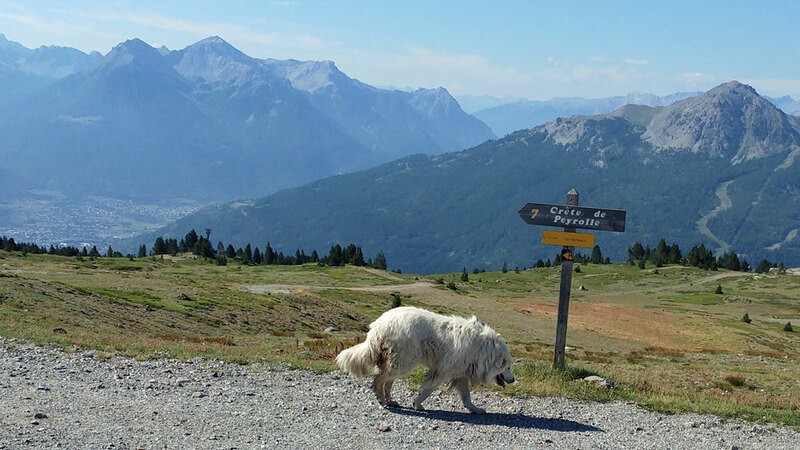 Patou Sheep Dog Threat to Walkers in the French Alps? So far this year, either walking or mountain biking, I have had four encounters with a Patou. Two were insignificant, one was a bit of a Mexican stand-off and the other was a little disconcerting. Prior to writing this I did a shout out on FaceBook to locals here in Serre Chevalier about people's experience with a Patou, and they ranged from one guy running and climbing up a tree to another being bitten. I am more than aware of them and know what to expect, plus I'm used to dogs. But if it's your first time they can be really intimidating and even more so should you have a nervous disposition when it comes to dogs. 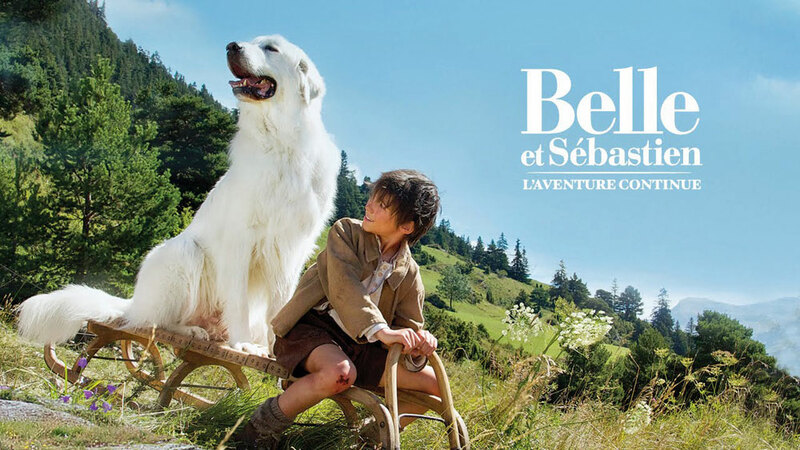 In the photos and films, such as Belle et Sébastien* they might look friendly, however, they can be quite the reverse! It has to be said that it's far far worse if you happen to be mountain biking especially on the descent as naturally you suddenly surprise them and it's not just a Patou but many a dog will give chase after a cyclist! This video below is of a recent encounter I had when cycling up hill (hence I'm out of breath), when initially the dog came running at me and, for the first ten or so seconds, I was a little nerve racked with him barking very aggressively. By the time I started filming he'd settled down, but again I knew what to expect and, as the sign at the top says, 'If you come across one of these dogs, stay calm and wait. as they need time to identify you'. Keep in mind that these dogs are not trained to attack but to deter, however, that does not mean that they will let you go near their sheep! The dogs establish a protection zone around their flock and make sure that nothing disturbs it. If they spot a potential threat, they will first seek to identify it by coming closer, then, if they accept that you are not a threat, they soon leave. I have had one spot me and my dogs from well over a kilometre away and he quickly came towards us. That was my first up close encounter with a Patou and I had to pick my two Jack Russels up, (even though the sign advises do not pick them up) and let him have a good sniff. Then he merrily walked along with us wagging his tail before getting bored and going back to his sheep. 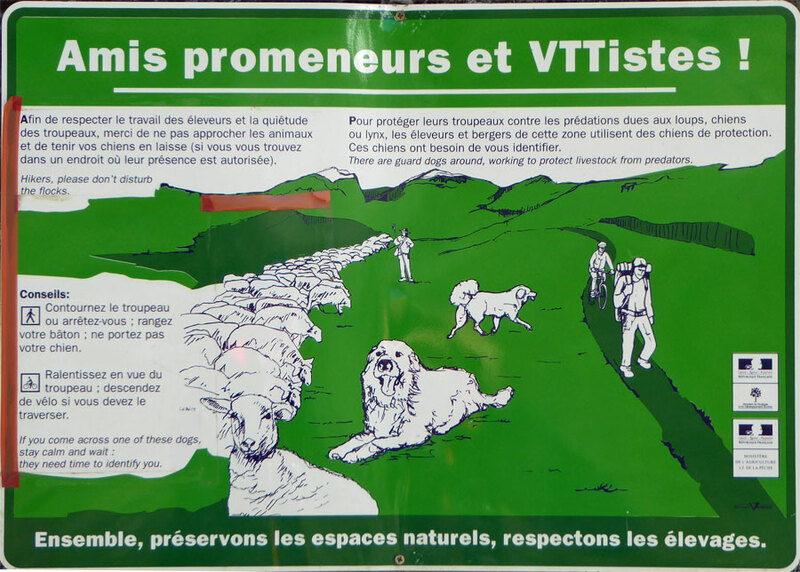 There have been numerous reports of a Patou attacking walkers and you only have to enter 'Attaque de chiens de mouton Patou sur des randonneurs dans les Alpes Françaises' into Google.fr to see. There is even a FaceBook Group set up to initiate a petition to have them banned. However, the use of a Patou to protect sheep is fascinating. They are introduced to the flock as a puppy and they develop strong links considering it as their own. They are the only ones responsible for its safety and even shepherds can have issues with their own dogs. But like anything to do with dogs it is all down to the initial training. And some are better trained than others, as are the shepherds! In the Mexican stand-off encounter (picture below) I was walking with a mountain guide friend when we came across this on on the walkers' path. We had already passed a large group of school children who were now behind us. The shepherd was above and my guide friend entered into the most bizarre of conversations with him, along the lines of 'Is your dog ok, will he not attack us?' to which the shepherd just did a classic Gallic shrug of his shoulders. So when my friend went on and stated 'I only ask as I have read reports of these dogs attacking people' the shepherd responded, 'well you'd better go and ask them then'. By this time I was getting frustrated as it was obvious that it was all some way for the shepherd to pass his day and I approached the Patou who was quite laid back and, again, his tail started to wag. In hindsight there were actually no sheep close by. 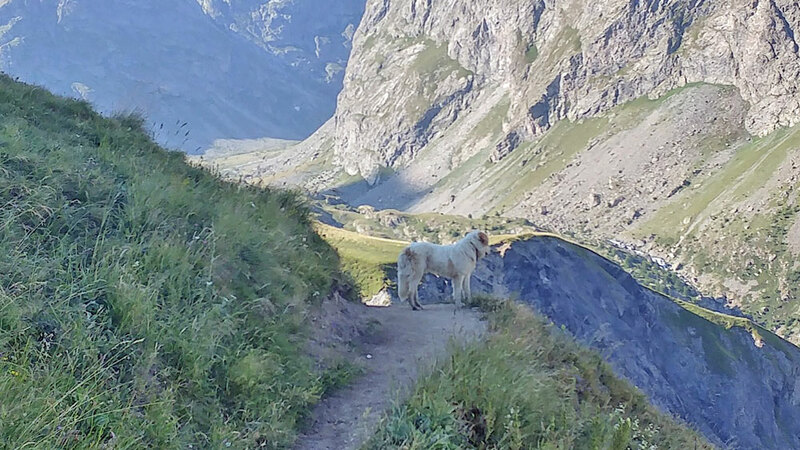 Later on we had it confirmed by the owner of the cafe at the Col du Lautaret that numerous people have complained about the antics of this shepherd and his dogs! There are surveys as to the effectiveness of the Patou in protecting their flocks and there is absolutely no doubt that they do deter wolf attacks that are now becoming more prevalent. Another fascinating element with regards to the Patou being embedded with the flock is that we have seen, very early in the morning, two or three separate Patou walking back up the road from lower down in the valley, where presumably they have returned for food and are now heading back to their flocks. The problems really only exist in the height of the summer when many more walkers are out in the high altitude pastures and, maybe, they are unaware of the potential issues. However, quite often I do question why the flocks and shepherds are quite so close to popular walking and cycling routes. It's almost as if they are doing it on purpose? And recently I was in Italy (20km inside the French Italian border), where wolves are probably more prevalent and they too have similar signs, but I only came across herds of cows along with herders. France could soon be home to 500 wolves as part of species conservation plan. The proposal, which would increase the number of wolves by around 40 per cent is designed to ensure the survival of the species in France. The country's farmers are opposing the plans, having already complained about the financial losses caused by wolf attacks on livestock. Environment minister Nicolas Hulot’s proposal includes financial aid to help farmers protect their livestock using electric fences as well as Patou. The plan also allows around 10 per cent of the wolf population to be culled every year to prevent attacks on flocks. There has also been a study on the effectiveness of the Patou and it covers 42 dogs, of which the Patou constitutes 90% of the survey, most of them male, (70%). With a Patou attacks fell on average by 70%. 84% of breeders has not suffered any attacks or they had been reduced by upwards of 90%. Attacks are obvioulsy more severe where flocks are not protected, 98%. 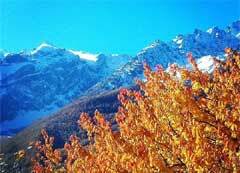 And if interested in wolves in France this site is well worth looking at.